Why should you adopt from us? Because these lovable animals all need safe homes and we are confident they will add as much joy to your life as you will to theirs! Here are some of our adopted friends in their new homes. Send us updates and pictures of your new family member(s) at columbuspetrescue@gmail.com ﻿and/or post to our Facebook page! Just click on the Facebook icon in the upper right corner of the page! 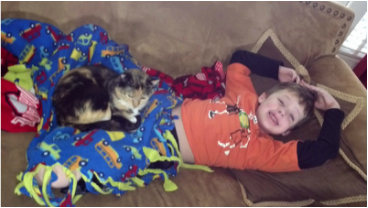 Here is Cocoa, taking good care of her best friend Owen as he recovers from strep throat! Millie (left) and Barry (right) meet for the first time! Frank (left) and Millie (right) are the best of friends since their adoption! This is a favorite sleep spot for them. This is Millie (left) and Barry (right) lounging in their new place! 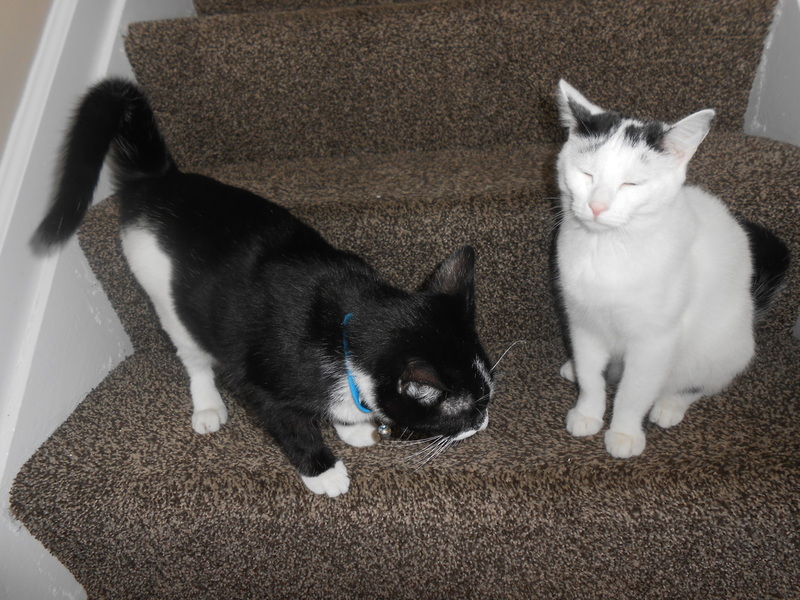 Pepper (left) and Patches (right) hanging out on the steps in their forever home. 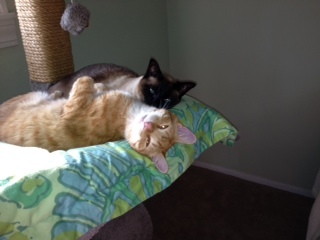 They were adopted in December 2013 and this brother and sister are one happy duo! This is Pixil! He has found the perfect family and has become an ambassador for the rescue. We believe everyone deserves a pet like this guy! Recognize these cuties? Hint: look at the main photo under the "Cats" tab! This is Gracie (laying by the flowers), Tiger Lily (gray kitty, Tigger for short says mom! ), and Zoe (all black). These three girls were adopted in June 2013 as babies and have been doing great since. Their family says they have some silly meows in their house! Gracie's sound like she's saying "meep" and Zoe's sound like she's calling "ma". Very happy to hear they are doing well! This is Remi, sleepy from a full belly and a long day of playing with his new family! His forever family says he is so lovable and fits right in at home. He is still learning his new name (we had been calling him Joey) and is happy as can be! Here are Boomer (left) and Big Boy (right) on Day 3 of their new lives as best buds! CPR rescued Boomer while trapping strays in the Columbus area. 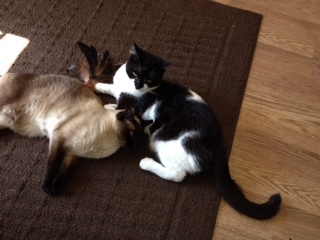 Both fellows are positive for HIV and cannot be around other cats due to risk of spreading their disease. When Boomer was found, we worried that he would never find a forever home because of his condition. Yet over the 4th of July, Big Boy and his family welcomed Boomer into their home and they have quickly become great companions! 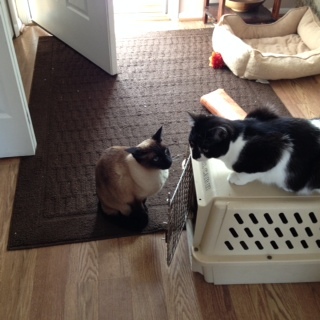 Here are Cocoa and her new buddy hanging out! "On Friday October 29th, my husband and I became the proud parents of this little Darling. He came into our home with confidence and curiosity and quickly became the favorite (don't tell our other kitties). He is sweet, intelligent, playful, and very outspoken! We just love him SO much and couldn't be happier with our little blessing!" 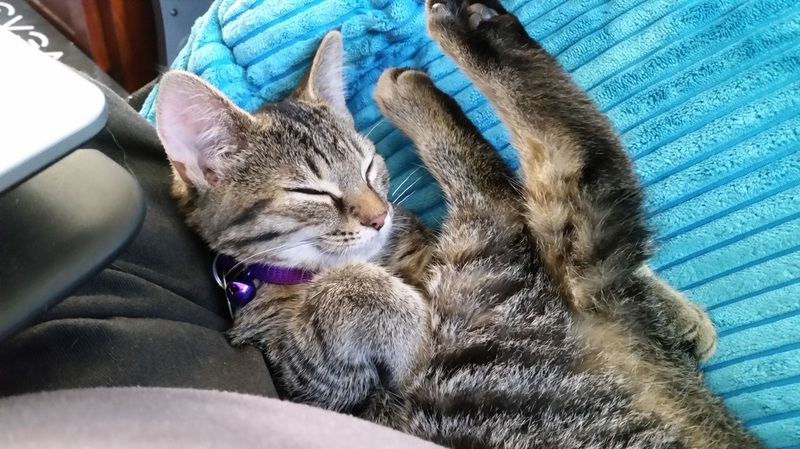 "My sweetheart and I recently adopted a little kitty named Misty at the Hilliard PetSmart adoption event. She is a wonderful and playful little kitten, full of vim and vigor. We renamed her Morrigan, which seems to fit her mischievous personality. I have attached a picture of her relaxing in one of her favorite spots, curled up in a chair next to my sweetie purring big happy purrs. The whole family loves her and we look forward to many happy years with her!" It is hard to believe that these babies have gotten so big! George and Oliver were rescued during the Polar Vortex and these curious, sneaky brothers were adopted together into a great home! Their family just adores them and we are so happy to see their smiling sweet and probably a tad bit spoiled faces loving life in their forever home! Frankie has been such a great addition to this family! Here he is with his best buddy Joel, holding him and reading to him. His new family says that Frankie waits for Joel to wake up in the mornings and follows him everywhere. Frankie has put big smiles on everyone's faces and is so happy to be well loved!